The Travis upholstery collection will be the perfect fit for your living room, offering updated classic styling that will complement your existing decor. These high quality pieces are made in America, and feature supportive and durable DuraCoil cushions. Use a sleeper sofa to create a home where you can comfortable sleep guests overnight. 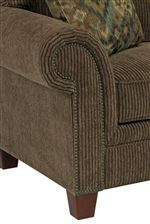 Curvaceous rolled arms are accented with classic nail head trim, and sleek tapered wood feet add a touch of modern sophistication. Browse other items in the Travis collection from AHFA in the area.